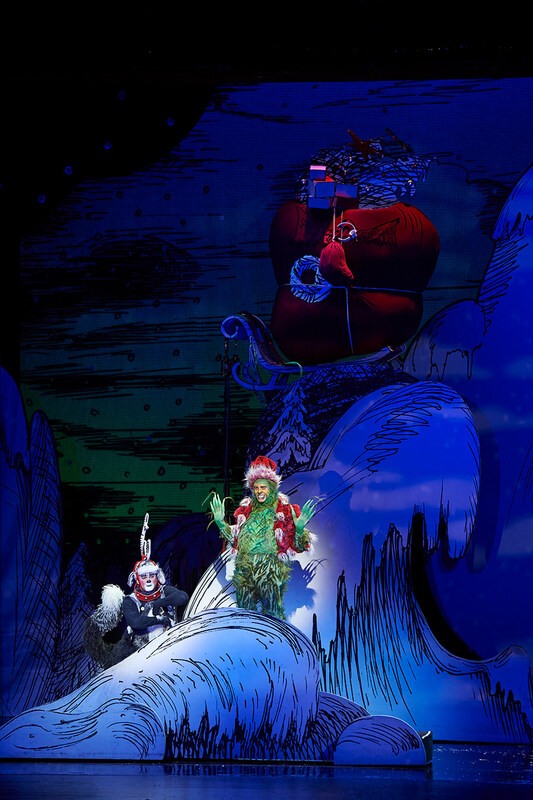 Dr. Seuss’s How the Grinch Stole Christmas! The Musical at the Chicago Theatre, directed by Matt August with book and lyrics by Timothy Mason and music by Mel Marvin, was a lovely family treat that deftly balanced sweet and salty flavors. I saw the show with my eight-year-old daughter Zoya and her six-year-old friend Sadie. The kids loved the Chicago Theatre itself. Running around taking photos of the architecture and each other in its Versailles-like space was fantastic pre-show entertainment. Obligingly, there was a nice Grinch cutout just for such photo ops. Attending families were in the hum-bug spirit—one little one dressed as The Grinch and few parties were sporting matching Grinch gear. One group reported that the show is an annual ritual. 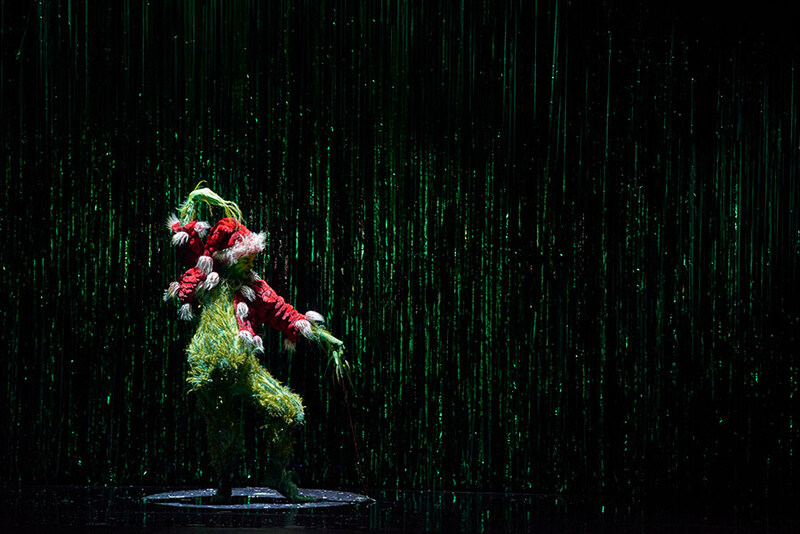 Gavin Lee as the Grinch, was brilliant and truly used his body as an instrument. His physical comedy chops were sharp, but his movements, down to expertly wielding the tufts of green fur at the end of his fingers to fidget and strum and clean and eat his ear wax, really brought the green grump to life. Zoya especially liked the scene of pandemonium where we saw the Grinch envisioning everything he hates about Christmas and Whos. It was reminiscent of the original Shrek book in which Shrek has a “nightmare” that he’s surrounded by happy, singing children. Oh, the humanity… er monster-ity! We observed here that the Grinch seemed sensitive to all the noise and lights of the season. In this and throughout, he was uncomfortable with physical touch and direct eye contact. It’s enough to make one wonder if he simply had un-addressed sensory issues. Avery Sell played Cindy Lou Who the night we went. She was a right little Christmas bonbon opposite the Grinch’s lump of coal. Sell has a beautiful voice and embodied the unique Who culture and physical habits (like holding hands horizontally bent out from the wrists à la the Dr. Seuss drawings and responding to “air” head-pats with sparkly little shimmies). Speaking of Who-ness, the entire cast be-bopped about Whoville as ambassadors of Christmas fun. 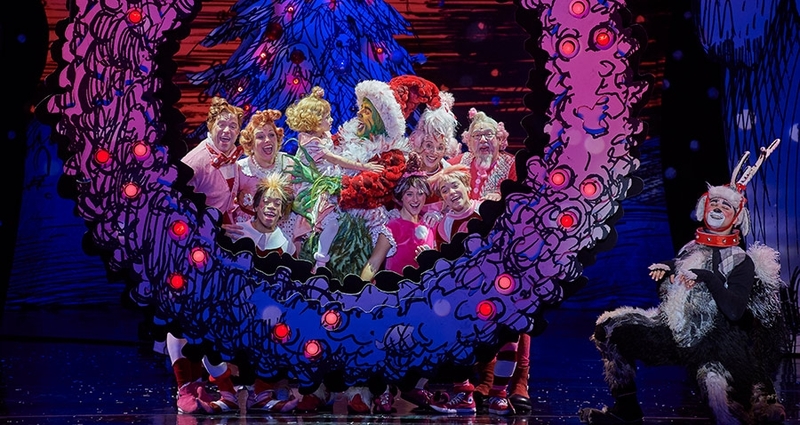 It would all have been a bit too much if it weren’t for a number on Whoville’s main street that highlighted how their Christmas cheer had been tainted by materialism. 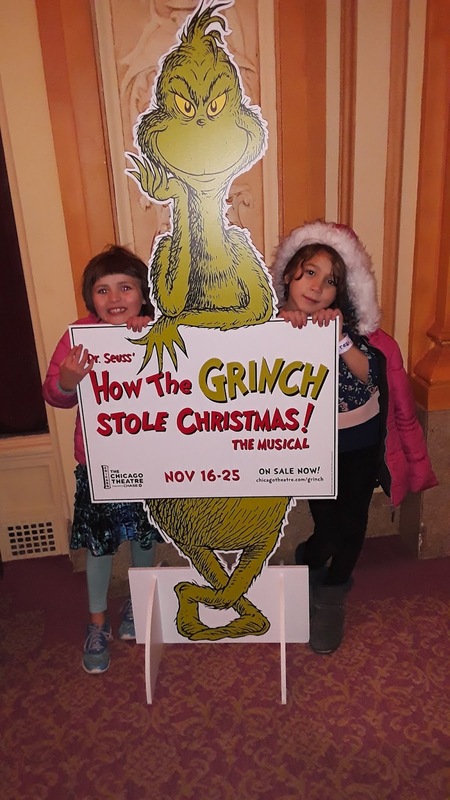 It was a relevant critique of our own society and served the purpose of demonstrating that the Whos had as much to learn from this experience as the Grinch did. The sets and lighting were impressive and true to the original Dr. Seuss drawings. In one of our favorite scenes, the Grinch and his dog Max were convincingly portrayed sledding down the mountainside to Whoville at breakneck speed. Clever drops quickly moved us through various locations, provided a snow effect that made the girls gasp, and created a Vegas showroom atmosphere for the Grinch’s more self-aggrandizing moments. The costumes were equally fantastical. One of Sadie’s favorite parts was the way the Grinch’s illuminated so she could see his heart growing. It was a clever trick to make an older Max (the dog) into the narrator, and Ken Land brings the right amount of austereness to the role, balanced by the tremendous physicality of his young dog self. The youthful Max was perfectly played by Aleksa Kurbalija. He was the quintessential Grinch’s best friend, as instrumental as Cindy Lou in his master's transformation. Zoya complained that we never find out why elder Max is leaving Whoville, which is a great point as the entire setup of the story is based on the conceit that he’s looking back over his life as he relocates in his old age. I wish the cast had been more diverse. There seemed to be three people of color in a cast of about twenty. However, none of them had (major/noticeable) lines and the puppets meant to portray the Whos from a distance (an uber creative idea that worked well otherwise), all appeared white. This vanilla vestige of Seuss’s era needs updating. 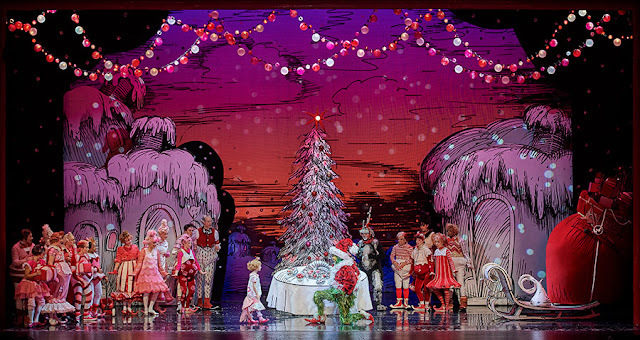 The production was just the right length for younger children, and both girls raved about the rousing closing number. 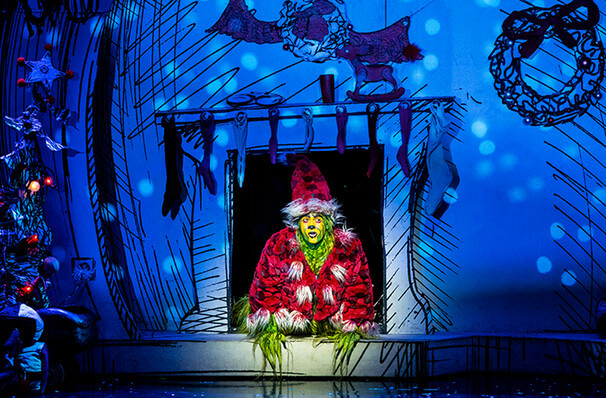 If you’re looking for family holiday fun and a way to expose your children to theatre, The Grinch is the gift that keeps on giving. Out of 1,125 entries, congrats again to Jennifer K, ChiIL Mama's WINNER of 4 orchestra tickets (up to $500 value) to opening night, Friday, November 16th, 2018. Disclosure: It's our pleasure to partner up with The Madison Square Garden Company and The Chicago Theatre on this sponsored post. They have provided us with complimentary tickets for our giveaway and for review purposes. As always, all opinions are our own.